Beejhy Barhany, an Israeli Ethiopian opened Tsion Cafe in 2014 in Harlem's historic Sugar Hill district. Her goal was to bring the Ethiopian and Mediterranean healthy culture and living to the Harlem community because this area was her home. The location of Tsion Cafe is famously known for being Jimmy's Chicken Shack. Back in the 40's, that's where Malcolm X and Redd Foxx were frequently spotted hanging out and where jazz saxophonist Charlie Parker Jr., washed dishes before his big break. live music and art of the community when dining at Tsion Cafe. Three signature dishes that should be enjoyed is the Ethiopian Veggie Combo - Shiro atakilt, red lentil, kik alicha, gomen, beets served with injera; Tsion Eggs - caramelized onions, smoked salmon with injera and Shakshuka - 4 poached organic eggs sauteed with organic tomato, onion, pepper, spices and cilantro with bread. Inerja comes with a number of the meals at Tsion Cafe, it is made with teff grain, a tiny round grain that is native to Ethiopia, it is also gluten free. The fermentation process takes about 3-5 days. This process is what gives injera its mildly vinegary (sour) taste. At Tsion our injera is made in-house, so it is always fresh. The dishes are from recipes that were passed down from her grandmother and mother and live on as a legacy to celebrate them at Tsion. These women influenced and shaped her into the woman she is proud to be today. Due to her global travels, she has added her twist and flavor to these already flavorful dishes. Beejhy wanted to tell her story. As an Ethiopian-Jewish women in Israel and then the US, the narrative of Judaism did not include the thousands of years of history and cultural relevance that the Ethiopian Jewish community added to the larger story of Judaism. She started a non-for profit that created cultural showcases in the NY tri-state area, encouraging filmmakers and artists to have the opportunity to exhibit their works while promote the cultural heritage of the Ethiopian Jewish community. In doing these regularly, food became a cultural staple at these showcases. The response encouraged her to open the restaurant. It was an important way to showcase her culture in the community, and food is the gateway to learning a new culture. Guests can enjoy a brand new menu that includes appetizers/bar menu, dinner and brunch which included Falafel. Recently, they introduced new handcrafted spirits to the drink menu. Patrons can enjoy their outdoor patio area while enjoying their meals. Read the March Issue of Athleisure Mag and see Athleisure List | Tsion Cafe in mag. Anna Kaiser is the Founder of AKT, one of the nation's fastest growing luxury boutique fitness franchise concepts. Growing up as a dancer, Anna constantly struggled to find ways to keep herself in shape. She opened her first studio on the Upper East Side in 2013. Anna wanted to create a culture and a brand that combined the personalization of private training with the community and electric experience that a boutique studio offers. AKT has an incredible fit following, with notables such as Kelly Ripa and Shakira. She found that the consumer would plateau after only a few months of working out at a single modality studio (barre, Pilates, yoga, spin, etc.) because the workout wasn’t changing. AKT was a solution to provide members with an ever-changing workout experience focused on something no other fitness concept does — a kinetic approach to physical wellness with a cutting edge in pop fitness culture. AKT is a full-body workout that combines cardio-dance intervals with strength and training. AKT offers four unique class modalities: Dance, Bands, Circuit and Tone. Dance: A dance-based interval workout that pairs dance, cardio and toning. Bands: A unique interval workout that uses overhead bands and a box to work on full-body conditioning. Tone: Tone is our strength-focused low-impact muscle endurance class, that ends with a guided foam roll. Circuit: Circuit is our timed full-body power and strength class. Guests at AKT have access to towels, water and an AKT retail shop. AKT On Demand is available to download and has over 800 subscribers per month. From the beach to the gym or your hotel suite, AKT's streaming workout videos are available to help you continue your AKT program. New content is added every week and you can choose which class to take based on what equipment you have with you any how much time you have. Locations are currently in NYC, The Hamptons and Connecticut. Additional locations will open in LA, Miami, Dallas, Detroit, Denver, Westchester, Charlottesville, New Jersey and Arizona. 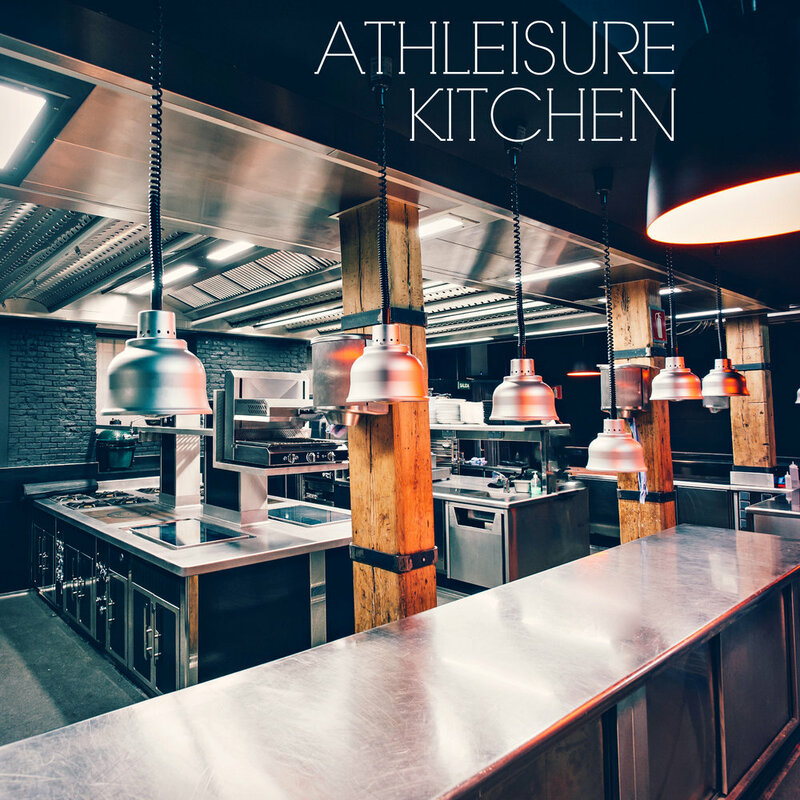 Read the March Issue of Athleisure Mag and read ATHLEISURE LIST | AKT in mag. If you're out in Venice, California we highly suggest checking out Karen Lord Pilates Movement. Its founder, Karen Lord comes from a fashion and art background and created this studio and method to connect the endless benefits of classical Pilates while delivering it in a contemporary and mindful package that offers a true connection to each person that walks through the door. After her successes in New York, Karen wanted to expand to Los Angeles. This version of her studio started as a pop-up this past July, and they quickly saw a nice client base expanding quickly. Between people from New York who were excited to come in, or people who heard about Karen and her online videos, it started growing quickly. When working out at their Abbot Kinney location, you will find a contemporary studio rooted in classical Pilates. In the studio, guests can enjoy 10 reformers in the space. Each trainer has their own style and many of the classes are designed to highlight that trainer's special approach to Pilates, but with the commonality that they are all guided by the unique approach of Karen Lord Pilates Movement. You'll experience the individualized attention from highly knowledgeable and truly loving trainers, but will be kept safe and guided throughout the entire experience. This studio is known for their individualized attention and focus in a well designed, clean and fashionable studio. In addition, this studio trains to the client's body and not the other way around. In addition to group classes, private ones are also available each day. Clients can be matched with their ideal trainer depending upon their desires and needs. Guests can enjoy changing rooms and bathrooms; however, showers are not available. Merchandise and apparel are for sale in the Love Shop- a well-curated collection of KLPM's favorite products and accessories. In addition to this studio, Karen will be the headline Pilates instructor for Wanderlust this year in Squaw Valley as well as Seattle. There are a number of collaborations with local and national brands that will be coming up. Whether you can attend the studio or not, Karen Lord Pilates Movement will be releasing videos online in the next month so anyone worldwide can train with Karen. Read more from the Feb Issue of Athleisure Mag and see Athleisure List | Karen Lord Pilates Movement in mag. When it comes to farm-to-table fast casual dining options, The Little Beet has been one of our favorite places to eat since 2014! Known as a 100% Gluten free restaurant, this growing chain with a number of locations in NYC and continuing to add additional cities to its roster, utilizing seasonal and local ingredients by sourcing them from farmers and purveyors that believe in this way of bringing foods that are good for you - to you. Because of the commitment to this vision, there may be variations in the menu depending on the location that you are visiting. Navigating the menu at any location allows culinary diversity whether you are dairy-free, soy-free, vegetarian, vegan, gluten-free and nut-free. One can create their own meals or select from a series of bowls that are packed with proteins whether you stopping in for breakfast to enjoy parfaits, breakfast bowls or sandwiches or you're opting to swing by for lunch and dinner to enjoy a number of bowl options. Common ingredients that are found in their dishes include: jackfruit, kefir chicken, mixed greens, avocados, salmon poke, golden beets, black beans, pickled onions, seeds and more. Dishes are created with inspiration from global dishes and are meant to fuel your body with positive nutrients that leave it feeling great. In addition, there are a number of beverage brands that are offered to accompany your meal from Wonder Drink Kombucha (our personal favorite is the Asian Pear), Spindrift and Nitro Cold Brew Coffee, as well as baked goods to end your meal on a sweet note. The Little Beet is part of Aurify Brands, which includes: Melt Shop, The Little Beet Table, Fields Good Chicken, and Five Guys Burgers and Fries. In additional partnership with The Little Beet is Ugly Produce is Beautiful which works to ensure that they reduce food waste in produce when it comes to not consuming it or simply not buying it because it doesn't have the symmetry or beauty that is expected upon purchase. In their restaurants you will see images by Sarah Phillips of her series, Ugly Produce is Beautiful. With locations in a number of cities, surrounding areas an new locations that pop up, keep checking the website to see where they are in your area. Read the Feb Issue of Athleisure Mag and see Athleisure List | The Little Beet in Mag. Blink Fitness was created in 2008 to reinvent, disrupt and completely change the value gym category. Since then, everything Blink has done has been to rethink and improve upon that experience, with a huge focus on leveraging technology innovations to achieve its goals. Blink’s CEO, Todd Magazine, previously worked for companies such as Pfizer, Gatorade, Quaker Foods, and Proctor & Gamble. Striving to bring every member world-class customer service, attention to detail, and a high-end design sensibility, he’s hired top-of-the-line leaders, from Operations and Technology to Marketing. His leadership team comes from incredibly diverse backgrounds outside of the fitness category to ensure Blink is thinking differently. 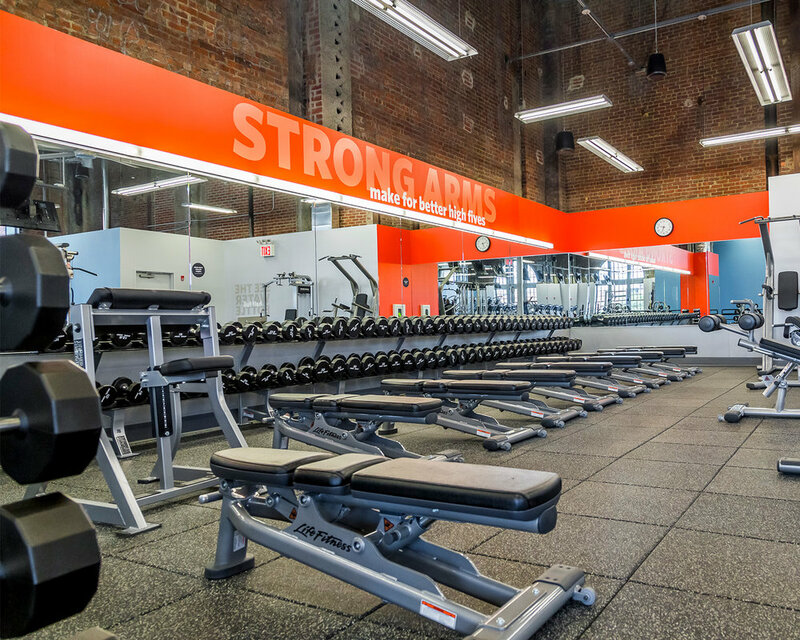 This gym launched in 2011 with three locations: Blink Noho (NYC), Blink Paramus (NJ), and Blink Yonkers (NY). Today, you can find us across the country in New York, New Jersey, Philadelphia, Boston, California, Chicago, Detroit, Dallas and many more to come in 2019! Every member gets a free 30-minute start-up session, then after that, they can choose one of our two amazing Personal Training Programs, which starts as low as $30 a session! You and your trainer can break sessions into 30 minutes or do the full 60 minutes, it’s up to you! Our Mood Lifters are known for working hard with our members, creating personalized plans that help them meet their individual fitness goals. Our showers are stocked with a nourishing 3-in-1 shampoo/conditioner/body wash you’ll love. Blink also offers unlimited towels to members for only $10 a month, and have special Vengo vending machines, just in case our members forget something important! We’ve made it personal! Blink Fitness just launched the first-of-its-kind Personalized Mobile Companion. This revolutionary technology was designed to change the one-size-fits all gym landscape for good. It enables Blink members to receive a daily, person- alized content feed tailored to their specific goals that will enable them to exercise better, eat better, recharge better—and live better. Plus, with our premium experience at a value price—we’ve completely redefined what it means to be a gym. Blink is always expanding and thinking with a tech-forward mind. Our new Personalized Mobile Companion is the first on a roadmap of initiatives that were born out of a proprietary, two-year research & development undertaking that included more than 3,000 gym and non-gym goers across the U.S. The study revealed that there is no one reliable source for people to turn to for help. Most use search engines, but are frequently confused and overwhelmed by the amount of information they receive. For example, a search for healthy recipes will deliver a whopping 2.4 billion results and a query into the stretching will get you 1.6 billion articles to sort through. Our Personalized Mobile Companion simplifies the quest by custom-building member profiles that align with their healthy living goals, interests and preferences, and provide personalized content, based on that member’s profile. Stay tuned, there’s more to come for Every Body! Read the latest Jan Issue of Athleisure Mag and see Athleisure List | Blink Fitness in mag. As an athlete her entire life, Kait Hurley ran cross country and track competitively in high school as well as running at the Division 1 level in college. While her coach in highschool pushed her to be the best, there was a balance of staying focused while keeping it fun. But when she was in college, she realized that she was chasing perfection. This drive to train harder, be faster and to lose weight to do better continued well after she stopped competing and thus created anxieties. As she began working in the health and wellness industry she tried foods, changed her exercises and reduced her anxiousness. A breaking point after a series of anxiety attacks led her to consider meditation, although she was concerned that it would make her lose her edge and drive. She realized that by embracing this method she felt more steady and was better at responding to stress. Even with the benefits of this practice, she still dreaded doing it and felt that after working long hours that she didn't want to choose between working out and meditating. When she combined movement with meditation, she was able to start exercising and moving her body before she even meditated which let her lose the feelings of dread that she had. By harnessing the energy and endorphins created during her sweat sessions, she found that she was more patient and open to the experience of sitting, thus enjoying the practice. It was understanding this element that led her to launch Move & Meditate Method. Kait and her husband Peter launched the KAIT app in November. It's the first app to fuse a variety of exercise styles with meditation. KAIT offers a wide ray of audio and video classes on the go to boost your energy, uncover your inner strength, and develop a more resilient body and mind. All classes focus on helping you be more present in your body and in the moment. Movement sessions are set to pumping music and include everything from high intensity sweat fests to audio-only-running workouts to grounded yoga flows to restorative, chill options if your body needs a break. Every class ends with a short, guided meditation to help you train your attention and refine your ability to work more skillfully with the energies of the heart and mind. With KAIT, you can get your workout and meditation done in as little as 20 minutes. Most classes do not require any other props than a yoga mat or an optional set of 2-pound weights. Classes are available for download for offline functionality when you’re looking to fully disconnect and can be streamed to your TV via for the best visual experience. KAIT offers a variety of guided programs to stay consistent and deepen your practice. With the app’s scheduling capability, you can pencil workouts into your calendar for up to two weeks, so you know exactly when you can make time for yourself. To optimize follow through, KAIT sends friendly follow up reminders and tips to get the best results. New classes are added on a monthly basis. Feedback from subscribers is appreciated as they received requests for a prenatal Move + Meditate class, so Kait teamed up with her friend Arianna Maag to make it available and it’s become one of the most popular classes! Last summer, Move & Meditate Method partnered with Andrea Mason from Abhinaya to co-lead the brand's first retreat last summer in Bali. They will do it again in April 5th - 10th in 2019 (there are a few spots left so DM them to snag a spot). In addition to the app and retreat, the method has partnered with nonprofits and organizations who are fighting racial and social justice. Due to their work to dismantle white supremacy and to make a safer world, those who do this work can feel burned out due to the emotional labor they extend. By providing this service to them, they can take better care of themselves and can continue making an impact. Read more from the Dec Issue of Athleisure Mag and see Move & Meditate Move in mag. Steve Pasterino, Celebrity Fitness Trainer who is known for his work with Victoria's Secret models, is the founder of P.volve, a method that focuses on elongating the body. Steven's philosophy is steeped in the belief that fast and sweaty workouts were not resulting in making the naturally proportioned, lean bodies that women want. His method focuses on ensuring that women are able to obtain their desired tone and definition without straining, damaging or bulking muscles. to reserving classes within a group, you can also have one-on-one personal classes). there is storage for personal items (cubbies and coat racks), face/body wipes deodorant spray, hair dryers, dry shampoos and hairspray. Read more from the Nov Issue of Athleisure Mag and see Athleisure List | P.volve in mag. What makes ChaiseFitness stand out is the unique patented system designed with an overhead bungee system and a state-of-the-art fitness chair. This system provides the framework in which new programming is continually developed (right now there are 10 types of classes) fusing together Pilates, ballet, strength training and aerobics. Focusing on building long, lean, and sculpted muscles, clients improve their posture, spinal health, core stability and strength due to the overhead bungee system and use of resistance bands. ChaiseFitness is still a family business, that lends itself in creating a strong sense of community, which is why it is important that it always has small class sizes to ensure all clients get hands on corrections, connect with the instructor, and most importantly learn how to work in proper form. With celebs such as Vanessa Hudgens, supermodels Anne V and Jessica Hart who have been trained in the method, it is for everyone. The college student, the working professional, young moms as well as clients in their 60’s and 70’s. The method is low impact with a focus on building long, lean strong muscles, improved core strength, enhanced posture and spinal health. Classes can be done at all the different phases of one’s life: wedding, pregnancy, post natal, rehabbing an injury and of course, just the daily work out to keep you in amazing shape all year long. ChaiseFitness launched in 2012 with locations in the UES and Flatiron. They expanded their franchise model in Madison, NJ and plan to open of a studio in Maplewood, NJ in early 2019. At the Flatiron studio, all of the signature classes with intimate class sizes (max 12 per class) as well as private sessions. There are over 10 types of class offerings which include: Chaise Reinvention; a signature class incorporating the fitness chair and overhead bungee system, ChaiseCardio uses the same equipment with the addition of cardio aerobic intervals, and one of the most popular classes BandSculpt using various resistance bands to sculpt and strengthen the body. At the Upper East Side location you can still experience intimate group classes, and have a full traditional Pilates floor dedicated to offering private sessions and small reformer classes. Unique to the UES location is the ability to take private sessions in all the various modalities - an hour session can include working on a reformer, TRX, and wrap with the chair and bungee system. Both locations offer clients towels, a filtered water station, digital lockers, and select hair and face products so guests can refresh post-sweat session. In February 2018 Chaise On Demand's platform debuted. Clients can access all of the content through the desktop or the ChaiseFitness app, which offers pre-recorded fitness videos such as 7min ab blast or a 20 min full body chair workout. Clients also get access to live streamed studio classes. The content is updated monthly so clients are constantly challenging themselves from the convenience of their homes. Read more from the Nov Issue of Athleisure Mag and see Athleisure List ChaiseFitness in mag. We find that throughout the week we are always selecting fitness methods based on what we are looking to target or to ease ourselves into the day. Sometimes, you're focused on legs, your abs and on others - you need a really good stretch! We all know that you are supposed to stretch before and after a workout and many of us own foam rollers where we can continue the practice at home. Stretch*d provides a Stretch*r which is certified to be able to maneuver your body. Whether you have an appointment or not, you can opt for a Quick*e (25 mins), Flex*d (55 mins) and E*longated (75 mins) for a full body stretch out. Even if you only have 15 minutes to spare, they can work within this timeslot as well. In addition to these packages, there are additional add ons. There are services such as the Anti*aging Stretch which which incorporates a Light Slim LED that focuses on your face, feet and lower leg. You can opt for Get Buzz*d which adds a Hyper Volt to your treatment, Get Relax*d that adds CBD Cream neck massage, Lengthen*r which adds 10 minutes to your base package, Get Puls*d which is a 20 minute leg compression with Normatec Recovery Bootie, Get Stimulat*d is a 20 minute massage with a smart muscle stimulator the PowerDot, and if you happen to not have the appropriate clothing, you can also rent an outfit so that you can be in comfort. range of motion and posture, reduce pain, increase longevity and keep you stretched out. Read more from the Oct Issue of Athleisure Mag and see Athleisure List | STRETCH*D in mag. session, which consists of 20 stations. You have 20 seconds to get from one station to the next one before you start your 2 minute drills. Those who do this workout find that it is truly a total body workout and it consists of plyometrics, strength training and cardio. It's a challenge that allows you to sync in with your instructors (which there tend to be around 10 that float throughout your session) and your partner as you continue with the workout. Whether you take the class religiously or just from time to time, the workouts change from class to class so there is no way that you will be bored or be able to go on "autopilot". It's all about intensity, intervals and of course - variety. amenities including showers as well. Read more from the Oct Issue of Athleisure Mag and see Athleisure List | Switch Playground in Mag. debuted with a three-tier group of exercise programs: FLOW (Yoga-Inspired Mobility and Strength Series at 60°F), SLIDE (Cardio Slide Board Core & Conditioning Series at 55°F) and HIT (Battle Rope-Infused HIT Series at 45°F). The flagship studio includes male and female identifying locker rooms with Nebia showers, an eight-person communal infrared sauna experience and exclusive Brrrn apparel. The Brrrn Coldture™ is a body-positive community that strives for progress, not perfection. Jimmy T. Martin and Johnny Adamic are multi-hyphenates whose backgrounds extend beyond the real of fitness. Martin is a former Division I athlete who has 10 years experience as a private trainer to C-Suite executives and influencers in fashion and entertainment. He also worked as a freelance copywriter and background performer on Saturday Night LIve from 2011-2016. Adamic's background is in public health and journalism. Prior to Brrrn, he worked for the NYC Department of Health & Mental Hygiene and served on former NYC Mayor Michael Bloomberg's Obesity Task Force doing obesity and chronic disease prevention. He also wrote for The Daily Beast as their health contributor. He earned his yoga teacher training and personal training certificates. He met Martin at a private training facility in Soho. When you exercise in cooler temperatures, you optimize the fitness experience because you burn fat, you can grow a tolerance to cold, and cooler temperatures provide the optimal temperature for working out. In the long term, frequent and routine exposure to cooler temperatures can help you acclimate to cold. This means you can spend more time in cooler temperatures, allowing you to reap more of the benefits. Read more from the Sep Issue of Athleisure Mag and see Athleisure List | Brrrn in mag. Bizzie Gold is one of the world's top Personal Development and Wellness experts with 5 global brands held by BUTI Inc, her parent company which started in 2012. It has grown into a global business in 27 countries. This parent company recently launched B MVMNT in May in the LES. With the success of her Buti Yoga in 2012 that included a number of streaming videos, in May 2018 she launched the brand's first brick and mortar studio. The Stanton Street studio offers a carefully curated experience of Celebrity Trainer Bizzie Gold's unique movement and wellness methodologies. All B MVMNT class sequences utilize spiral structure technique® to facilitate the deep release and toning of the body - physical, emotional and energetic. Through primal movement, dynamic asana and cardio-sprints, students breakdown the emotional barriers that hold them back from achieving self-love and true human connection. Music guides the classes like an internal GPS - no more 8 counts or reps. The beat blended movement forces you out of your head and INTO YOUR BODY. It is in this magical place that you integrate your human experience instead of escape it. All formats incorporate elements of shaking and vibration to help release stored trauma and stimulate cellular organization. B MVMNT offers drop in classes in addition to 3 membership tiers, private training and nutrition counseling. The studio includes a community infrared sauna complete with BOSE sound system and chromotherapy lights, NKD by Bizzie Gold retail shop and Golden Ratio protein bar. Non-heated classes are taught in a room with ambient temperature of 78-80F while heated classes are taught with far infrared towers to gently heat and detoxify the body - the ambient temperature may rise between 85-90 degrees. The lockerrooms are equipped with changing rooms, wifi equipped lounge, community vanity complete with DryBar blow dryers and products as well as a 4 person infrared sauna. Guests can also purchase NKD by Bizzie Gold at the retail shop as well as purchase items from the Golden Ratio protein bar/cafe. Read more from the Sep Issue of Athleisure Mag and see Athleisure List | B MVMNT in mag. Located in midtown, in a 20,000 state of the art fitness hub, Neo U Fitness is not only about housing a number of concepts within its walls, but it is a live streaming and on demand platform for top trainers and brands that make itself available to a worldwide audience. This fitness center uses cutting edge technology to link people to these elite trainers. The focus is to highlight great fitness methods while exposing and growing fitness brands. With a belief in fitness and wellness, both are integrated into the offerings provided. There are 3 studios where guests can take boxing, yoga, bootcamp, dancing and more. Check out the schedule to see who or what method will be showcased on your date and time of interest. Each room is designed with interchangeable equipment and atmospheric projectors. 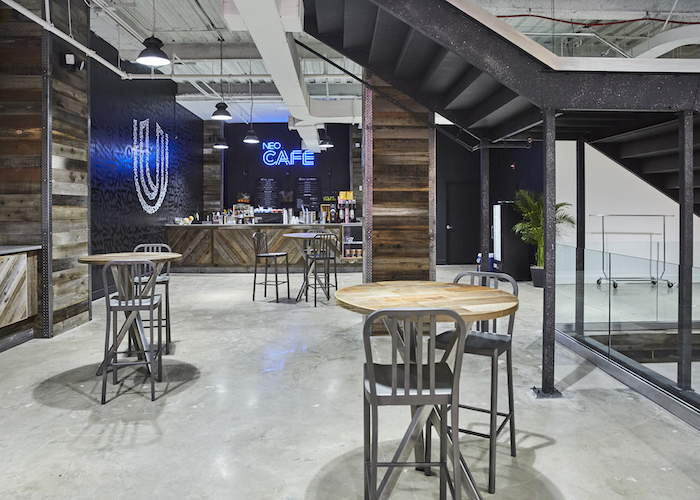 In addition to the studios, the cafes come along with premium amenities are available for its guests. There are plenty of showers, daily lockers, and a NEO Cafe serving juices, smoothies and acai bowls. In a recent class, we enjoyed the lounge area where we were able to chat with our fitness host pre and post class. There is also a boutique to purchase apparel as well. With live streaming cameras available in the studio, Neo U is focused on being the Netflix or Amazon of fitness to truly provide access to their offerings worldwide. Read more from the Aug Issue of Athleisure Mag and see Neo U Fitness in mag. Founded in 2013, Sourced Adventures’ mission is to make the outdoor accessible and affordable to anyone and everyone who lives in New York City. Since then, they have expanded to more than 5 different US cities and now offer a suite of international destinations as well. Sourced Adventures has its roots in the travel industry. The brand’s founder, Kyle Davidson was an Adventure Tour Guide in a previous life. Now, that same commitment to a great customer experience is embodied by the company’s tour guide feels as a central sentiment within the company culture. The SA Management team now consists of a diverse group of travel professionals with varied experience including the Ski industry and Outdoor Education. We had the pleasure of attending a recent trip that left NYC and combined yoga in a vineyard, a wine tasting and some free time to enjoy the space as well as to continue drinking more wine. Day trips include your transportation, lunch on site and the opportunity to bring a group with you or to meet new people. Trips leave from two locations in the city earlier in the morning and return early evening which allows you to go home and continue your night. Sourced Adventures has three main product offerings. The flagship products are local adventure day trips out of several US cities including NYC, DC, Boston and Chicago. The goal with these products is to make it easy for absolutely anyone to escape the city and get into the outdoors. They also have several guided and unguided international trips to destinations such as Iceland, Mexico, Scotland and more. Finally, they work with corporate and private clients to build tailor-made international itineraries or custom corporate retreats. Feedback is an integral part when it comes to adding new adventures to the offerings at Sourced Adventures. When we attended our adventure, we noticed that a number of people had attended their Hiking and Brewing Program or had planned to do so. According to the Sourced Adventure team, this trip was included due to repeated requests from the community of travelers for a hiking trip to be offered. Read more from the August Issue of Athleisure Mag and see Athleisure List | Sourced Adventures in mag. 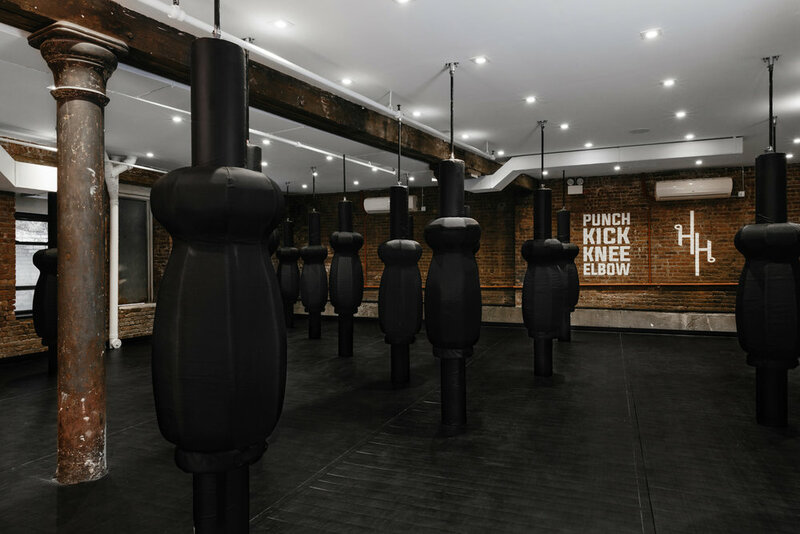 In March 2018, Muay Thai focused method, Hit House opened in Nolita in a luxurious boutique studio. Created by husband and wife co-founders, Tyler Scott and Dana VanPamelen this studio offers Traditional Muay Thai kickboxing and Private Training. Hit House is the first of its kind concept, focused on bringing the world of Muay Thai into group classes. This fitness method is disrupting the fitness landscape by making Muay Thai accessible to all types of fitness enthusiasts at all levels. Classes are led by Muay Thai fighters turned trainers, the 50 minute fast paced, full-body workout class is designed to improve your cardio, muscle tone and fight skills with every punch, kick, knee and elbow. From the very beginner to the experienced fighter, all will find this class challenging and fun. Tyler co-designed an exclusive floor to ceiling bag with Century Martial Arts called Bishop - hybrid heavy bag/fight dummy, designed to lessen the impact and prevent injury (and no bruises!). Bishop incorporates elements from four of the most commonly used bags in string-based martial arts. By combining these bags into one, this allows class members to train with lightweight gloves and leave the studio sans bruises. It's made with a dense foam and doesn't swing from a chain, rather it bends and flexes with your strikes so you'll be able to throw more, full power combinations and really improve your technique. boutique hotel with industrial finishes, clean lines, and Thai inspired greenery. With plans for expansion in multiple studios, the Nolita location offers men and women's locker rooms with showers, full refresh bar, lockers, state-ofthe-art sound system, exclusive Hit House apparel, gloves (rental at $2, for purchase at $20) and Hit House quick wraps (purchase for $2). Read more from the July Issue of Athleisure Mag and see Athleisure List | Hit House in mag. Former professional dancer, choreographer and celebrity fitness instructor Lauren Kleban is the founder of LEKfit which opened officially in 2016 in the Larchmont/Hancock Park area of LA. She created a dance-inspired fitness method designed to create long and lean muscles by using intervals of low impact, high intensity, fat burning cardio with muscle sculpting techniques created to strengthen and tone. LEKfit takes a musically driven approach to fitness with Lauren consistently drawing inspiration from her ballet, jazz, burlesque and yoga training to create fun and effective workouts that empower and promote body love and acceptance. Lauren has trained a number of celebs including Busy Phillips, Emmy Rossum, Lindsay Price, Alia Shawkat, Katie Duplass, Ever Carradine, Lara Worthington, Judy Greer, JoAnna Garcia, Charlotte Ronson, Elizabeth Chambers, ad Katherine McPhee. This method offers three different concepts. BOUNCE is a signature intense cardio and muscle sculpting workout. Each class includes a warm-up, low impact, high-intensity cardio session using mini Jump Sport trampolines, leg, arm and core series plus a cooldown. SCULPT is a ballet and yoga inspired class designed to create long and lean muscles. Each of these classes includes a warm-up, leg, arm and core series plus extended stretching for optimal muscle recovery. FUSION is a high-intensity cardio and muscle sculpting class that incorporates the best parts of each LEKfit workout. Each class includes a warm-up, intense cardio session, leg, arm and core series plus a cool down and stretch. Amenities that guests can enjoy at this studio include showers, changing rooms, a waiting room and the Joovv infrared light. For those that want to continue taking classes outside of the studio session or for those that may live outside of LA, Lauren launched LEKfit On Demand early 2017. Those who connect with this service see Lauren in her LA garage studio with the LEKfit On Demand. This service allows you to stream two brand new fifty minute full-body workouts every Wednesday directly from her studio and LA clients. This service offers hundreds of full body workouts. You'll also find do anywhere + anytime shorter workouts and "add-ons" which allow you to mic and match what you do based on your time and ability. Read more from the June Issue of Athleisure Mag and see ATHLEISURE LIST | LEKfit + LEKfit in the Studio. We had a chance to check out Spiderbands last month at an editor event for an accessory brand. We enjoyed the method and had to find out more about it. Created by Franci Cohen, a group exercise instructor, and fitness expert for over two decades, she launched Spiderbands, in November 2017 in New York City within one of NYCs fitness hubs - Union Square. Guests have access to luxurious locker rooms, showers filled with high end products by Philosophy, hair dryers, plush towels, wet bags for your sweaty clothes post-workout, Spiderbites (their signature energy bites), water bottles, and more. Spiderbites are little balls of bliss, with just the right combination of ingredients to fuel you pre and post workout. They are high in fiber, low in calories, and are decadent to eat! This fitness method is in the preliminary stages of developing a live steaming platform. Soon, those who are interested in being able to fly with Spiderbands nationwide from their own homes! Read more from the June Issue and see ATHLEISURE LIST | Spiderbands in mag. When visiting Sahra Spa & Hammam at the Cosmopolitan Hotel Las Vegas, we suggest the Oxygen Radiance Facial. This treatment is a partnership with Intraceuticals products and patented technology. Intraceuticals is a professional cosmetic skin care brand founded and formulated in Australia. The Oxygen Radiance Facial is based on the concept of delivering hyaluronic acid and custom anti-aging ingredients deep into the skin’s structural layer through high pressure therapeutic tic grade hyperbaric oxygen. The supporting line of revolutionary skincare products was designed to combat free radical attack, supply essential vitamins and ultimately restore elasticity to the skin. This facial launched in 2014, followed by the Signature Decadent. Youth. Glow. facial in 2015 which fuses three of the industries most coveted technologies - HydraFacial, Intraceuticals and NuFace Microcurrent- into one innovative treatment. The 43,000 square-foot spa boasts 16 massage rooms, including four body treatment rooms with private steam showers as well as two hydrotherapy rooms. For guests looking for a complete spa getaway, there is the luxurious penthouse spa suite, complete with plush seating, a steam room, complete spa services and dining room service. cultures from around the world. Radiance Facial. This combination is great for all skin types and helps calm sensitive, dry and stressed skin, which is often a side effect of air travel, while providing instant hydration and lift.